Posted on Mon, Apr 9, 2012 : 10:19 a.m.
Michigan football coach Brady Hoke is ranked No. 12 in Athlon Sports' list of the top 30 coaches in America. 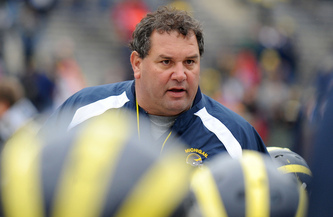 Michigan's Brady Hoke is No. 12 on Athlon Sports' list of the top college football coaches in the nation. The website puts Hoke one spot ahead of Michigan State coach Mark Dantonio, who was responsible for one of Hoke's two losses in his first season in Ann Arbor. Also on the list is former Michigan coach Rich Rodriguez, who checks in at No. 29 heading into his first season at Arizona. Alabama's Nick Saban, who Michigan will face in its season-opener on Sept. 1, is the top-ranked coach on the list. First-year Ohio State coach Urban Meyer is No. 2. Two teams that Michigan beat in down-to-the-wire finishes last season have coaches ranked ahead of Hoke. Frank Beamer of Virginia Tech, who the Wolverines beat in the Sugar Bowl, is No. 4 and Brian Kelly of Notre Dame, which lost under the lights at Michigan Stadium, is No. 10. Tue, Apr 10, 2012 : 10:58 p.m. Typical Michigan fans, don't like the results attack the source. Need to step outside the bubble once in awhile. Tue, Apr 10, 2012 : 5:45 p.m. I guess if you have a 15-22 3 year overall record and 6-18 record in the B1G you get to be # 29 on this list. And I guess if you are 0-1 versus the # 29 guy then you get to be # 10 on the list. Sounds like a great list. Tue, Apr 10, 2012 : 1:50 p.m. I think Bertoni's recent escapades should amount to some accolades for him. Coach Urban Meyer will fit in well at OHIO simply because he's a loser, and he matches up to the Buckeye tradition of winning at any cost. Meyer will do whatever it takes to get an unfair advantage. Tue, Apr 10, 2012 : 11:08 a.m.
Too many polls. You can bet Urban Meyer got a number 2 nod because he won two national titles while at FLA. A coach with a great wining record like that in the past need not be a great coach. The way the FLA football program came apart at the seams shows you a great lack of sustainability, take into account the large number of players who were arrested tells me Urban Meyer lost it as a coach. Tue, Apr 10, 2012 : 6:26 a.m.
Tue, Apr 10, 2012 : 4:12 a.m.
Can anybody please tell me a good and convenient spot to play ball after I leave the Spring game????? Coming from Birmingham, AL and I'm trying to get in a gym somewhere. GO BLUE!!!! Tue, Apr 10, 2012 : 4:07 a.m. The Athlon site is, generally speaking, a pretty good read. That said, the list is pretty silly. Saban at #1 is defensible. Some of the other choices less so. But here's where we can draw comfort -- I'd bet Hoke honestly, truly and sincerely doesn't care one bit about such things. Not one bit. Top of the list, bottom of the list, not on the list ... not one moment's thought about it. Hoke is a man of near singular focus for those things that matter. Athlon lists don't matter. Getting the team ready for the fall matters. Period. Tue, Apr 10, 2012 : 2:38 a.m. I love how all Michigan football articles in this rag now require a State reference in the headline or copy. Go Green! Mon, Apr 9, 2012 : 11:27 p.m.
obviously the rating is a reflection of the overall program. One 11 win season makes you king in ann arbor, but it doesn't pull a whole lot of weight in the real world. Number 12 is about right for Hoke and UM. Tue, Apr 10, 2012 : 2:18 a.m.
obviously the rating is a reflection of the overall program. . . a 6-7 losing season just makes you a JOKER in c-bus, but is pathetic in the real world!! GO BLUE!!!!!! Tue, Apr 10, 2012 : 12:51 a.m.
Once again, you should be afraid. I sympathize with your fear and admiration of UM as demonstrated by your continued presence on this site. I'm sure you don't go to Indiana or Purdue's sites because you don't see them as a threat. UM is, of course, a threat to ohio and coach meyer. As we both well know, Hoke has already brought UM back to national prominence with an 11 win season and BCS bowl victory, while Meyer is already getting called out for the fraud he is (and was, at Florida). Meyer will last 3 years, 4 max, and then will either quit or be fired while Hoke CONTINUES delivering the goods in A2. I feel for you, brother. Don't worry, though...your next AD may hire a coach with more staying power. Mon, Apr 9, 2012 : 11:13 p.m.
One look at the current state of things in Florida will tell you that Urban Meyer is not the nation's number two coach. He left that program in shambles. The ability to win NCs should be weighed against program stability and player development/character. Mon, Apr 9, 2012 : 11:39 p.m.
You pretty much sound like Obama. Blame it on everyone else. There won't be any question on his ability after this year. Mon, Apr 9, 2012 : 10:34 p.m.
Michigan has an exciting, up-and-coming program right now, but they need to accomplish more before Hoke can be rated higher than Dantonio. Mon, Apr 9, 2012 : 7:36 p.m.
Are you kidding me? Urban flyer number two with not a single game played at suckeye state. And Brian Kelly ahead of hoke? Have you ever watched that guy on Saturdays? His head has come close to exploding more than a few times. Whateve athlons smoking I want some. Mon, Apr 9, 2012 : 6:47 p.m.
Mon, Apr 9, 2012 : 6:27 p.m. I can't buy into this; ohio's two-and-done urban meyer never coaching a game at ohio, the character from east lansing in the top 50 and what's his name fired in disgrace, that held tryouts in the school parking lot, is this another 'owned' publication like the michigan state free press.......seriously ? Mon, Apr 9, 2012 : 5:34 p.m.
Really? We have two coaches who haven't even coached a game in a year on this &quot;list&quot;. One of them left here on - lets see here - not the very best of terms. And these guys make the list? and then we toot our horn that our guy made this list as well? What a pile of garbage. Mon, Apr 9, 2012 : 5:13 p.m.
Like the bowl games--which schools travel well--this is probably largely based on which schools buy Athlon's pre-season college football magazine well. Mon, Apr 9, 2012 : 6:23 p.m.
That is probably why that character dantonio is so high.....bad coach, big mouth - but probably buys in well to the Athlon. Mon, Apr 9, 2012 : 4:22 p.m.
Agree...you can make all kinds of arguments with this list. Although I'm a UM fan, but seriously, Hoke and Dantonio over Bielema, and by that much. Mon, Apr 9, 2012 : 3:19 p.m.
pardon me, but what the heck is the &quot;Athlon Sports' list of the top 30 coaches in America&quot; and why should I care? I have never heard of &quot;Athlon Sports&quot; before this story and now, I am supposed to think its a big deal? perhaps some context needs to be provided before telling your readers why this is an honor? Mon, Apr 9, 2012 : 11:36 p.m.
FYI, athlon sports has been in business since 2001. Located in Atlanta, Ga. You could Google it, ya know. Mon, Apr 9, 2012 : 4:58 p.m.